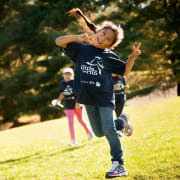 Change Lives as a Girls on the Run Coach! Coach a Girls on the Run team once or twice a week at a site near you! Over the course of a ten-week program, girls in 3rd-8th grade develop essential skills to help them navigate their worlds and establish a lifetime appreciation for health and fitness. The program culminates with girls positively impacting their communities through a service project and being physically and emotionally prepared to complete a celebratory 5K event. The season starts on September 17th and ends November 21st. Practices are 75-90 minutes long. You don’t need to be a runner! We provide all the training and supplies. We only ask that our coaches commit to developing and celebrating our girls.